Since it's Anything Goes, my card for the SSS Wednesday Challenge this week is a Valentine's Day card for my husband. He's not much of a hearts and flowers kind of guy, so I kept that to a minimum - but he does love coffee, so I used the SSS What's Brewing stamp set as my focal point. Most of the supplies that I used are from prior SSS card kits. I used the Grand Bazaar papers for my base layer. And I stamped the coffee cup and sentiment on white cardstock using Memento Tuxedo Black ink, then heat embossed using WOW clear embossing powder. The edges of the white panel were distressed using the Prima distress tool. I used the Love You and Valentine's sentiment from the SSS Paper Hug set - the Love You is stamped onto black card with Versamark, then heat embossed with white embossing powder. It reminds me a bit of the older label makers. I wanted to add a bit of dimension, so I used a heart stencil and Wendy Vecchi embossing paste in the corners. There's also a bit of clear embossing of the XOXO stamp on the pink background. I hope he will like it. SSS supplies are linked, below. Thanks for visiting. Very cute card! 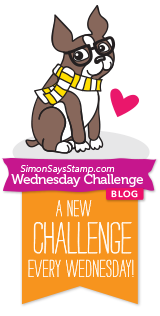 Thanks so much for playing along with us over on the Simon Says Stamp Wednesday Challenge Blog!